Melt 1 tablespoon of butter; add marshmallows and stir until melted. Remove from heat and add 2 cups of Cheerios, mix together. Spoon out heaping tablespoon of mixture and use lightly greased hands to mold into egg-like shape. 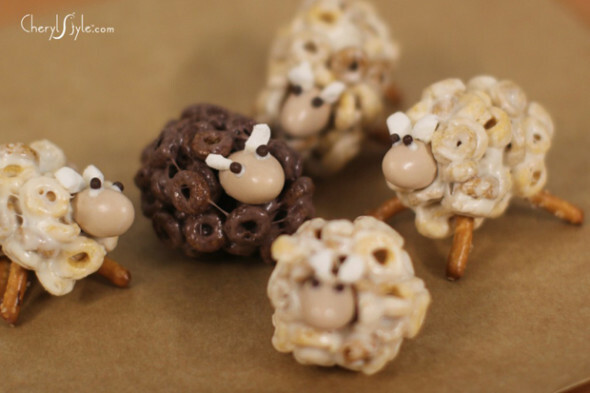 For legs, melt white or dark chocolate chips to use as glue; break pretzel sticks to ¾” lengths and attach to sheep’s body. Apply small amount of melted chocolate and press into end of body. For ears, cut mini marshmallows into small pieces and use melted chocolate to glue them on top of head. For eyes, dip toothpick into melted chocolate and add two dots to face.